There’s no hiding it is getting late in the year. Leaves are changing and it takes a while for it to warm up in the morning. There are still some butterflies around, but things have certainly slowed down. The most exciting record I have heard of in the past month is from just last weekend. On Saturday, September 29, Ralph Eldridge had an estimated 10 Common Buckeyes on Machias Seal Island, New Brunswick, including six that he saw at one time! These are the only Common Buckeyes Ralph has seen on the island this year. Earlier last week Ralph had a day with an unusually large number of Question Marks, so it appears these single day pulses can occur with a variety of the wandering species. 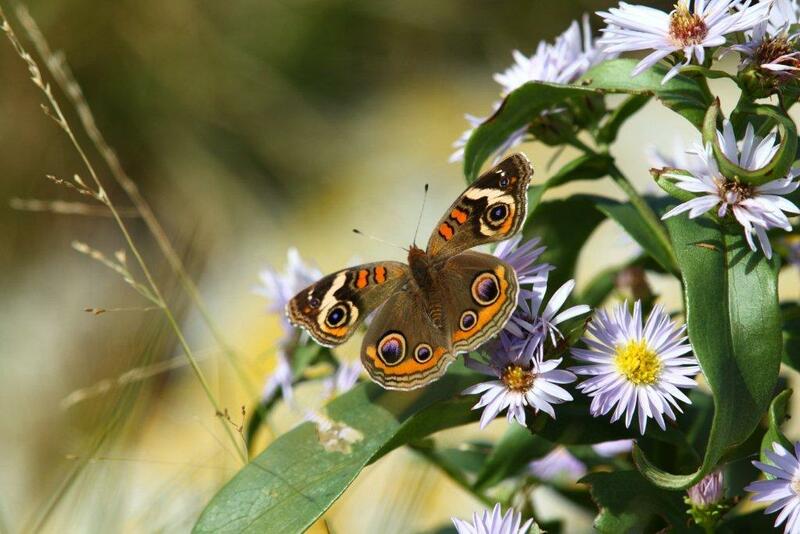 Another Common Buckeye was documented at Brier Island on September 17 by Ken McKenna, the third ever recorded in Nova Scotia. Species that are still being seen are Cabbage White, Clouded Sulphur, Orange Sulphur, American Copper, Monarch, Question Mark, Mourning Cloak, Red Admiral, Painted Lady, American Lady, and Common Ringlet. All of the overwintering species (the commas, tortoiseshells, and Mourning Cloak) should still be flying, though I’m not aware of any recent comma or tortoiseshell reports. On September 26, Phil Schappert had a very late Viceroy near Dollar Lake, which is later than any records from 2010 and 2011. I haven’t heard of any Peck’s Skipper records this fall. In both 2010 and 2011 there were reports from September and early October, members of a small second generation. Just how late might the butterflies go? The latest atlas record is Clouded Sulphur recorded by Rita Viau on November 13, 2011. There are three other records from November (one from 2010 and three from 2011). How far into the fall the butterflies fly depends on the weather. Until we have some really hard frosts there’ll still be things flying on the warm days. Given the current two-week forecast it looks like butterflies will be on the wing in most areas into the second half of October.